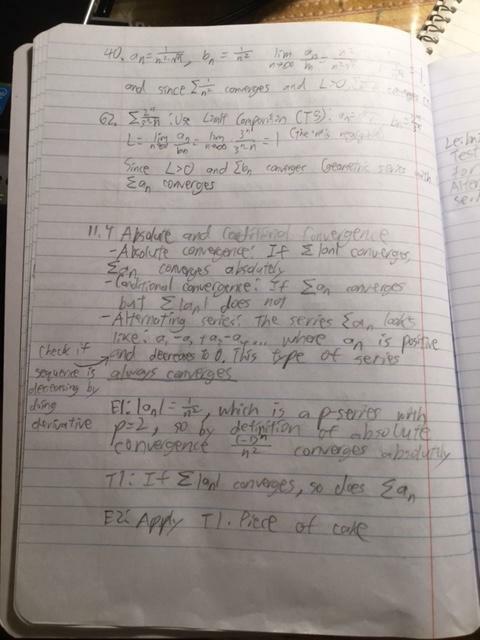 My professor requires her math students to take photos of their notes and homework to turn in. I've already lost points for unclear photos because I have white and dark patches that affect readability (see the top right corner of the example): . For taking photos, I only have an iPhone 5s and an iPad Air 2. How should I take photos in order to minimize or eliminate white/dark patches on pieces of paper? Should I set up better lighting conditions, and if so, how? I'm usually taking photos at night next to a desk lamp. To obtain an almost scanner-like image with minimal set up I'd locate two lamps either side of the paper. And then while taking the photo, locate the lens of the phone/tablet directly towards the center of the sheet. That is, if you place the sheet of paper flat on a table, the lens must be directly above the center of the page. The wide angle lens in most phones exaggerates perspective distortion, that is, your rectangular piece of paper wont show as a rectangle in the photo, but as a trapezoid. The side of the sheet that is further away from the lens will be smaller on the photo. You correct this by placing the lens equidistant from all four corners when taking the image. I make emphasis in locating the lens because many people do not realize the lens is (usually) on a corner of the phone or tablet, and try to center the phone respect to the paper. Just that small inch and half distance from center of phone to the lens is enough to distort the image due to perspective. The idea of locating two lamps is to achieve the most uniform lighting possible. Ideally, both lamps should be the same size and power. That makes things easier because if lamps are equal, you only need to place them both at the same distance from the sheet of paper. I'm thinking of just two simple desk lamps. Place them such that the bulb is 12-8 inches (13 - 20 cm) from the border of the sheet horizontally and vertically, and about the middle of the height of the page. It will also help if you leave a margin while writing, so no information is lost if the picture does not cover 100% of the page, that allows you to close up a little bit more and "cropping" part of the page (think leaving up to 1/4 of an inch or 0.5 cm out of the picture). This lessens the risk of showing the dark thing that supports your page/notebook. Of course, you can also put a white "background" under the notebook, so if the capture includes more than just the page, it wont be a problem. Try as best as you can of flattening the pages before taking the picture. 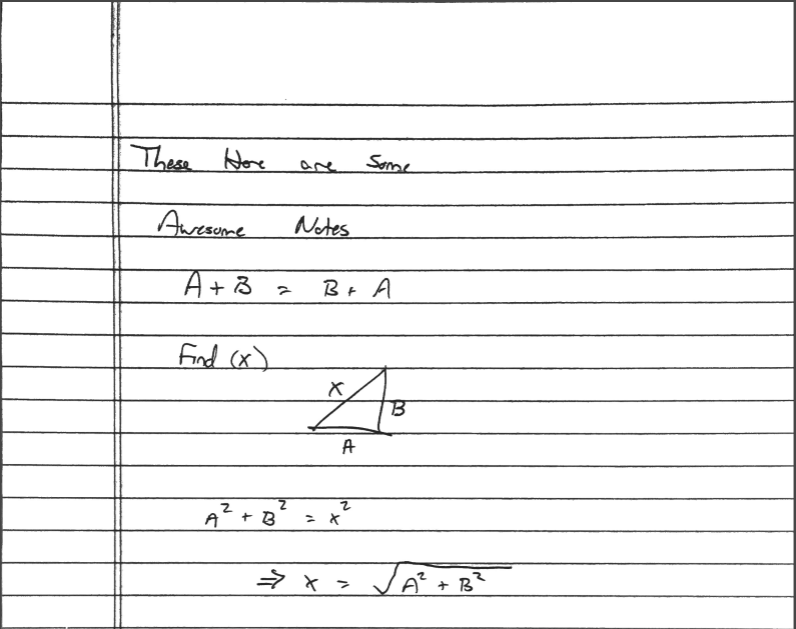 I realize this can be tricky or impossible with some notebooks. The white patch in your example picture is because at that point, the curvature of the page makes the angle of incidence/reflection of light match the direction of your lens. (Read on angle of incidence and angle of reflection) That is why I recommend placing the lamps at the sides at roughly 45 degrees from the center of page, so the reflection goes to the other side, away from the lens. But if flattening the pages results in much of a hassle, try placing the lamps above and bellow the page, to lessen the chance of direct reflection due to the bend o pages. Note: The two lamps idea is to allow to take the pictures at any time, but if you do it during the day, a nice unobstructed window is a very nice source of light, specially on an overcast day. I don't have the reputation to comment, so am adding this bit as an answer. In addition to the answer by @Jahaziel (camera position, lighting) - also check out scanning applications like Genius Scan. The app uses your camera, auto-crops, and then bumps the contrast to clearly show a white page and black writing. You're seeing that reflection because the page is not flat and is picking up reflections of the light source. So if you use something to flatten the top of your page down (a weight of some kind), you should mostly eliminate the problem. Best way for you, procure an all-in-one printer, one that also copies documents. These printers come with software that allow to save the scan as a JPG camera type file. This lash-up will make supper copies that will please you and your professor. First thing to try is to even out the lighting. Use a second desk lamp, placed on the opposite side of the subject. Also, don't let the desklamps be too close to the page. Set them on a pile of a few books, or some flat stable object, so the light source isn't way closer to one corner or side of the page. If a second lamp isn't practical, surround the space with white objects - cardboard, wall, whatever - to let the light from the one lamp bounce around and hopefully prevent the more shadowy sides/corners from being too dark. Load in the image as a layer. Call it "original". Copy this layer. Blur it, use Gaussian, maybe 50 to 100 px radius. The writing should be too blurred to see, as if not there. Call this layer "blur"
Set the compositing mode of the "blur" layer to divide. This removes the effect of uneven lighting. Final steps are routine image enhancements: mild small-radius unsharp filtering to sharpen the writing, and adjust levels so the page is white and writing is dark gray or black. This is a job for a scanner. Do you have a computer as well as your portable devices? Not the answer you're looking for? Browse other questions tagged iphone paper ipad or ask your own question. How can I import photos into Lightroom from my iPhone without getting the videos? What do I need to do to take Aurora borealis photos by iPhone4S? How does the iPhone 5s manage to take HDR photos at full-frame rate? How to take photos quickly through iPhone using Ricoh Theta SC? Is there a way to take photos manually from iPhones? How can I cause red eye in photos I take with my iPhone 6s? How I can capture photos like SLR pictures using my iPhone?